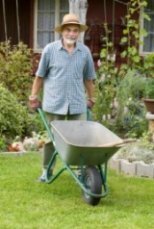 Retirement hobby gardening is a popular pastime because it offers so many pleasurable ways of solving the unsettling adjustments to life after work. It provides purpose and direction while rewarding us with tangible proof of our efforts. It schedules our time, gives us a sense of identity, and connects us to others of shared interest. Presenting our prize blooms for show can even satisfy our competitive needs and the joy the fruits of our labor brings to others, fulfils our need to be recognized and useful. It would be hard to find a more satisfying activity than gardening. It challenges our creativity, arouses our appreciation of beauty, connects us to nature, kindles our spirituality and instils us with a sense of pride. It even helps keep us strong and healthy. Research shows exposure to plants lowers the blood pressure, slows the heart rate and relaxes the muscles. It is also an excellent low-impact workout, mixing different movements, stretching, and toning the upper and lower body and burning calories while giving us a reason to get out in the fresh air. Gardening gives the mind a good workout too. Gardeners are always making plans for the future and learning more about their craft by spending time in the library, book store or on the web improving their knowledge. Gardening can even improve our social life. It is a great way to make new friends, share our enthusiasm and expand our knowledge with others of like interests. You can connect to other gardeners on line or find a garden club near you at any number of garden websites. It's not necessary to own a plot of land to reap the benefits of horticulture. There are many ways to turn small areas into growing spaces. Houseplants help keep our homes free of pollutants while filling it with beauty. Window boxes turn our sills into charming vistas or provide fresh herbs for our kitchen. Pots and containers convert the smallest spaces into flower or vegetable beds. Square foot gardening is a technique that uses little space by dividing the area into beds easily accessible from all sides. Living walls or vertical gardens grow up the sides of walls both outside and inside. Roof gardens are becoming a popular way to combat climate change by controlling building temperature. They also offer much needed recreational and agricultural space in the inner city while providing safe habitats for wildlife. Many volunteer groups, even in inner cities, convert fields and vacant lots into community gardens, enriching and contributing to the quality of life in our neighbourhoods and bringing people of all walks of life together. Taking time to not just grow but smell the roses may be the most rewarding part of all. When we sit back and contemplate the miracle of the seeds we planted growing to fruition we are witnessing and participating in the miracle of life. Gardening connects us to the earth in a profound way. A gardener's material is alive, never static, constantly changing, always in process. Our instruments are the elements: earth, air, sun and water. Our medium is the cycle of growth and decline. Our relationship to our work is between living entities. The fruits of our labors are tangible and plans for the future are always evolving. We grow more than just plants and flowers we also grow hope, beauty and sustenance thereby rejuvenating ourselves and the earth. The American Horticultural Society is dedicated to promoting excellence in horticulture since 1922. They can connect you to great gardens around the world, clubs, events, books, and answer your questions. Their headquarters, River Farm, is located on one of George Washington's original farms. You may visit its extensive grounds in Alexandria, Virginia or take a virtual tour of the twenty five acre site on-line. Retirement gardening hobby is an ideal pastime for experienced gardeners, beginners, and retirees planning retirement. It combines exercise, an appreciation for beauty, sometimes self sufficiency and great food. And it could earn you some extra income to augment your retirement financial planning. Gardening is a popular hobby for many retirees. Find some great tips for how you can make the most of your Allotment Gardening. Urban Gardening is a popular hobby among retirees. Here are some great tips for low maintenance urban gardening.